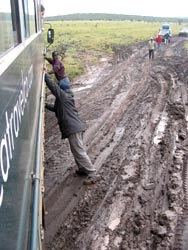 It was a long and muddy drive from the Masai Mara to Lake Naivasha, we were delayed by at least 2 hours by other trucks stuck in the mud and blocking the roads. We even managed to get ourselves stuck once or twice but never irrecoverably so (thank goodness!). Eventually after a much longer drive than it should've been, we arrived at Lake Naivasha and headed straight to Elsamere, home of Joy Adamson, author of Born Free. It was quite an interesting visit, we got to look thru their little museum room with loads of original paraphernalia of Joy & George Adamson from back in the day and we got to watch a video of Joy. She sure seemed to be a crazy lady, I wouldn't have liked to have gotten on her bad side, I think she was probably quite a battle-axe and clearly related far better with animals than people. @telama - Thanks, Glad you enjoy the blog :) Always nice having readers from such varied locations around the world.